When Lor and I decided to start looking into more drastic weight loss solutions initially, she had me watch Joe Cross‘ excellent documentary “Fat, Sick, and Nearly Dead”, chronicling his weight loss journey performing a 60-day “juice fast” and losing over 100 pounds in the process. While “juicing” didn’t really sound like my thing, I had to agree with the tons of nutritional advice in the documentary focusing on one major dietary problem in our lives: instead of a diet made up of 33% (or so) Fruits and Vegetables, our diet was nearly entirely made up of meats and processed foods. We made the decision that, when we could afford it, we would get a juicer or a blender and start making the necessary changes in our diets. 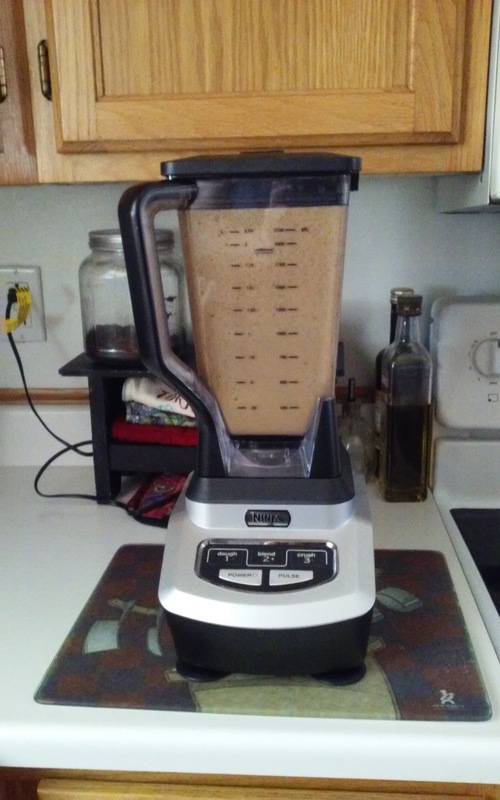 Oddly enough, we found a normally $200 blender/food processor combination in the Clearance section of our local mega-mart for 75% off within 48 hours of making this decision. Almost instantly, fruit and vegetable smoothies entered our daily diet, taking the place of our normal lunch routine. We both chuckled at the idea that “manning up” equated to eating plants. And I have been thinking about that laughter ever since. Why is it, I wonder, that we look at eating veggies as un-masculine? It can’t really have anything to do with the work involved in raising plant-based foods: any farmer will tell you that farming is anything but a weakling’s profession. It is work made up of days filled with long, arduous labor. We’ll have to look elsewhere for where meat = man. There is an inherently combative element to the idea of eating meat, I suppose – “Nature, red in tooth and claw”, and all that. But talk to any professional athlete about the idea of eating an all-meat diet and you will be laughed out of the clubhouse. Whole, plant-based foods contain nearly all the nutrients a human needs to survive and thrive. (Some vitamins can be an exception.) What the heck is so manly about being nutrient-deficient? But, the myth persists. We know a family where the wife attempted to start she and her husband on a daily regimen of plant-based smoothies, only to have the husband reject the idea. Why? Because it wasn’t “real food”. I, myself, have frequently mocked the people I know who prefer salads over steaks, calling them “tree-huggers”, and saying they are eating “bunny food.” Now, at 150 pounds overweight, I wish I had eaten more salads and otherwise kept my mouth shut. There is nothing manly about gasping for air after a walk around the block. Embrace your inner bunny, and start making decisions based on what your body needs, instead of the foods that you think of as masculine. Your six-pack will never be visible if it is hidden beneath a beer keg, like mine. Drinking My Lunch (And I Don’t Mean Budweiser). My 5-pound high blood pressure generator. Early this morning, I got up and sat myself in front of my computer. I had every intention of putting together a fabulous blog article, maybe a little something about “me vs. the scale” or something. But I could not concentrate. My thoughts went every which direction, all eventually returning to the furry, sleeping lump in the corner a few feet away from me – and her trip to the veterinarian later today. 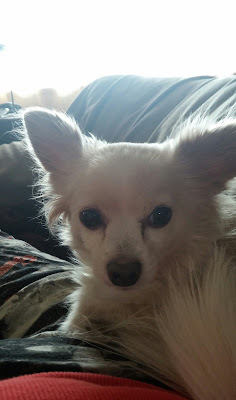 Knowing I could not write coherently in this mental condition, I gave up and wandered into the living room to watch TV, accompanied by my little friend, wagging her tail, blissfully unaware she might be spending her last few hours on Earth. And, for weeks now, my fuzzy ego-reinforcer has been in pain every time she goes to the potty. We have tried different diets, we have tried supplements, we have tried prescriptions, and nothing works. Every day, come “potty time” she screams as if we are shoving red-hot pokers into her, until she is finally done. She then ambles away, unconcerned, leaving us traumatized and wondering how we can take care of this – how can we keep her from suffering? It finally got to be too much, and we scheduled her with our local low-income veterinarian. (And, may I say here, thank God for places like Albuquerque Humane Society.) We knew full well that this might be a blockage in her intestines. A tumor in her abdomen. A tear somewhere along her digestive tract that might not be fixable with our limited resources. Even the amount we were going to use to pay for her office visit today was already budgeted for something else – a major surgery today would be completely out of our reach, and could leave us with the decision to have to euthanize our 6-pound supermodel. The thought of her leaving us forever, of coming home from the vet’s office without her, was almost too much to bear. We had a very tense and terrifying visit to the vet. We explained the problems, winced when the exam made her cry, felt vaguely guilty that we had not done something else that would have prevented us from coming to this point. And now, after all is said and done, we have medications to give her, even more instructions on dietary changes, and we have a major surgical procedure that we have to schedule and figure out how to pay for. And yet, when we left the office and put her back in the car, we looked at one another and both breathed a sigh of relief . It felt like a disaster, narrowly averted. She is asleep in the corner now, worn out from her stressful day. I could very easily curl up beside her and share that stress recovery. We now face a daily regimen of pills, a major financial headache, and an uncertain outcome – we still don’t know if any of this is going to work. Every time I hobble through the kitchen in my home, I have to turn my head away from the window so that I will not catch a glimpse of my nemesis. It is big, it is green, it is frightening, and it is NOT going to go away. But maybe, just maybe, if I don’t catch a glimpse, I won’t be overwhelmed by my feeling that I should be doing something about it. My arch-enemy is not a big green snake. It is not Oscar the Grouch, or Kermit the Frog. 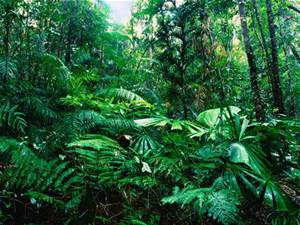 It is the huge, weed-infested yards that surround the home we currently live in. You see, our home was built in the 1950s, and is therefore not restricted by the Xeriscape requirements that most homes here in Albuquerque are. (Xeriscape is landscaping designed around low water use. Think cactus and rocks.) However, by the time we moved into the house 3 years ago, no one had bothered to do anything else with landscaping the home for years. So, when the weather starts warming up again, we wind up in a home surrounded by huge patches of weeds. Where there are not weeds, there is simply good old-fashioned dirt. In my head, I am the kind of guy who is out every weekend working on his perfectly manicured yard – a couple of small lawns, some fruit trees, even a garden for fresh veggies. In reality, I am disabled, mobility-impaired, and know nothing about yard care in the first place. So, I should just farm the work out, right? Last week, I attempted to do just that – I spoke with a handyman here in our neighborhood about what it would cost us to rein in my front yard. He took one look at my yard, filled with two-foot high weeds punctuated my 3 dead 10-foot tall trees that would have to be chain-sawed and removed, and quoted me a reasonable price – $60. But, no matter how I tried, I could not squeeze another $60 our of our household budget. Social Security Disability keeps our household held firmly below the poverty line, and leaves no money for things like contractor yard care. Discouraged, I decided to tackle the problem myself. I spent two hours with a weed trimmer engaged in combat with the front yard. The end result? I was laid out for 3 days from injuring my back and knees. And my front yard is just as ugly as it ever was – now filled with dirt and dead weeds, over which still tower my deceased trees. So, here I sit, crippled by my two disabilities – the one that keeps me from working (epilepsy), and the one that keeps me from moving (obesity). Between the two, I feel effectively trapped – and that gigantic patch of weeds in the back yard just keeps growing. Unless the Xeriscape Fairy arrives, I can expect that the situation is never going to change – even if I had the energy to take down all those weeds (which I don’t), I still wouldn’t have the money to replace them with something else. The circle of life continues. Warehouse store, or den of torture? Through the last few weeks of evaluation and preparation for bariatric surgery, I have been pretty happy with my mental attitude. I have been looking at the upcoming surgery as an opportunity to get healthier, not something that I am unhappy about or dreading. And I have, for the most part, been looking forward to the life changes that will come along with weight loss. Some sacrifices have to be made, sure, but they are all worth it, right? Then, I met my emotional Waterloo last Friday, on a grocery visit to our local Costco. At first, it wasn’t too bad. I decided as we entered, that I would check some of my favorite foods against the pre-surgical diet of 135 grams per day (or less) of Carbohydrates. We walked through the door and were immediately confronted with a rack filled with Costco muffins. Now THERE was something I would never have again, right? I checked the nutritional info, and boy howdy, was I right. Each muffin was 690 calories (1/3 of my daily caloric intake), with 79 grams of carbohydrates – almost 2 full meals worth. I shuddered a bit to think of the number of times I had eaten a muffin (or two…) along with a regular breakfast, and then moved deeper into the store. Things did not get easier once inside. Many of my favorite processed foods called out to me from the frozen section. Frozen hash browns stood out harshly – they are a required ingredient in one of our “staple foods” around here, breakfast burritos. 18 grams of carbs a serving…and a serving was only 3 ounces of potatoes. The last time I put only 3 ounces of potatoes in a burrito would be, let’s see, NEVER. More like three times that amount. So, 54 grams of hash browns in a burrito…and I normally eat at least 2 burritos for breakfast…that would be 108 grams of carbs, taken out of my pre-surgery 135 gram per day diet, before factoring in any other ingredient! More than two-thirds of my daily carbohydrate diet, gone in 2 breakfast burritos! Once I realized breakfast burritos were going to have to come off the menu, depression began to set in. We had to pass through the section filled with all the beautiful imported beers I will never have again. Through the aisle containing the Ghiradhelli Brownie mixes I would not be making again any time soon. I had a brief hope when we hit the fruit juices, hoping for some relief here (fruit is healthy, right? ), but, nope: a mere 8 ounces of Welch’s Grape Juice was a whopping 36 carbs. No more fruit juice as a Coke replacement for me, then, I trudged onward. And then, the breaking point. My nose recognized that strong, earthy scent, and I realized I had arrived at the coffee aisle. We are only a few days now from D-Day (Decaf, that is) here at home, and I simply could no longer bear the thought of what was coming down the road. I have been a habitual coffee drinker since 16 years of age and now it, too, will be making an exit from my life. I suddenly felt like a 6-year-old being hauled through Toys-R-Us and being told firmly to not touch anything. I looked back at the aisles filled with forbidden items, then looked into our cart filled with Kale, Celery, and multivitamins, and had never felt so betrayed in my life. My depressed mental state lasted all the way home. Once we arrived, I was left to unload the groceries from the car. And, after carrying 3 loads of groceries from car to fridge – a total of maybe 90 steps – I had to collapse on the couch, panting as if I had run a marathon. Oh, right. That is why I am doing this. While updating today’s earlier blog, I noticed that Facebook, in its infinite wisdom, is no longer producing links to blog titles. After an hour of arguing with the stubborn software, I turned to another piece of tech geekery: “If This, Then That.” Supposedly, this software will put out a Facebook message AND a Twitter message every time I publish. This would remove my having to do this manually every day, so I have attempted to set it up. However, Updating a current blog post doesn’t seem to trigger it – only a new post will do. Hence, this long-winded experimental post to see if the new software solution actually works. Thanks for your patience while I work this out, and I (hopefully) now return you to your regularly scheduled Misdirected.